Discuss the basics of the endogenous endocannabinoid system and how exogenous cannabinoids may affect this system. Relate a brief medicinal and legal history of cannabis. Appraise the current state of the medical evidence for the use of medical marijuana and cannabinoids in the treatment of pain, multiple sclerosis, epilepsy/seizures, neurological disorders, cancer and gastrointestinal disorders. Formulate a concise list of risks, adverse effects, and considerations to discuss with patients prior to cannabinoid treatment or certification. Compare current federal and state laws governing the use of cannabinoids. Explore future questions to be answered and research direction for the medicinal use of cannabinoids. The terms cannabis or marijuana refer to drugs produced from plants belonging to the genus Cannabis (Whiting, et al., 2015). Three specific species have been identified, Cannabis sativa, C. indica, and C. ruderalis. Ancient Chinese emperors suggested that cannabis be used for medicinal purposes over 4000 years ago (Schrot & Hubbard, 2016). It was listed in the United States (US) Pharmacopeia from 1851-1942 but was then classified as dangerous and without significant medical use by the United Nations (UN) Single Convention on Narcotic Drugs in 1961 (Schrot & Hubbard, 2016). In 1970, cannabis was categorized by the US Drug Enforcement Agency’s (DEA) Comprehensive Drug Abuse Prevention and Control Act (Controlled Substances Act) as a Schedule I drug in the US, meaning it has a high potential for abuse and no accepted medicinal use, making any further research significantly more complicated to conduct (Rosenberg, Tsien, Whalley, & Devinsky, 2015 and Bridgeman & Abazia, 2017). Medicinal properties of cannabis have been largely credited to the two most biologically active phytocannabinoids, Δ9-tetrahydrocannabinol (THC) and cannabidiol (CBD) (Mouhamed, et al., 2018). CBD was isolated in 1940, and THC was isolated in 1964. In the 1990s, the human endocannabinoid system was discovered, and the cannabinoid receptors, CB1 and CB2, were cloned (Rosenberg, Tsien, Whalley, & Devinsky, 2015). The CB1 receptor is found mainly in the nervous system, but also in the cardiovascular, visual, and gastrointestinal (GI) systems while CB2 is found mainly in the immune system. There are two major endogenous ligands that have been identified, N-arachidonoyl-ethanolamine (AEA or anandamide) and 2-arachidonoyl-glycerol (2-AG), which are released from post-synaptic neurons and activate receptors on the pre-synaptic neurons, thus inhibiting the release of neurotransmitters. These neurotransmitters attach to target organs throughout the body regulating cognition, coordination, memory, appetite, pain perception, heart rate, gastric motility, intraocular pressure, and immune function. THC is a partial agonist with a higher affinity for CB1 versus CB2, and CBD shows a lower affinity for both CB1 and CB2 as compared to THC. While THC is responsible for the majority of the drug’s psychoactive properties, CBD is thought to be non-addictive, non-psychoactive and potentially contains anti-inflammatory, anti-oxidant, and neuroprotective properties. The primary mechanism for action of CBD is largely unknown and continues to be studied, as it is believed to not be primarily mediated via the aforementioned CB1 and CB2 receptors due to CBD’s low affinity (Schrot & Hubbard, 2016). Within the US, there are two available synthetic THC formulations. Nabilone (Cesamet) is a schedule II capsule currently approved by the Food and Drug Administration (FDA) to treat nausea/vomiting related to chemotherapy, and dronabinol (Marinol) is a schedule III capsule/solution currently FDA-approved to treat nausea/vomiting related to chemotherapy as well as anorexia and weight loss related to HIV/AIDs. Outside of the US (Canada and Europe), nabiximols is a purified natural combination of equal parts THC and CBD in an oromucosal spray for the treatment of pain and spasticity (Schrot & Hubbard, 2016). According to the National Conference of State Legislature’s (NCSL) website (ncsl.org), medical marijuana is currently legal in 31 states, the District of Columbia, Puerto Rico and Guam, and CBD products are allowed in 15 additional states within the US despite cannabis’s continued classification as a schedule I drug by the federal government (National Conference of State Legislatures, 2018). The bulk of cannabis research is early and inconclusive. According to Whiting, et al. (2015), there is moderate quality evidence based on existing studies to support the use of nabiximols or smoked THC, neither of which are currently FDA approved for use in the US, for chronic cancer or neuropathic pain. This is based on 28 studies reviewed, most of moderate quality. Of these studies, 13 were conducted with nabiximols, 5 with nabilone, 4 with smoked THC, and 2 with dronabinol. 12 of these studies focused on neuropathic pain, as well as three on diabetic neuropathy, three on cancer pain, and two each on HIV neuropathy and fibromyalgia (Whiting, et al., 2015). Regarding the treatment of acute pain with cannabinoids, there was one randomized placebo-controlled trial of smoked cannabis and dronabinol in which researchers found decreased pain sensitivity and increased pain tolerance versus placebo, but this study was small (N=30) so more information will be needed. A similarly sized trial showed nabilone to be superior to ibuprofen in the treatment of medication overuse headaches. Chronic, non-cancer pain was studied in four trials with inconsistent results. (Mouhamed, et al., 2018). Cannabis use has been studied for numerous complaints within patients diagnosed with Multiple Sclerosis (MS). The American Academy of Neurology reviewed the literature related to patients with MS and rated the evidence for the use of oral cannabis extract (CBD or combination CBD/THC) in the treatment of patient-reported spasticity, central pain, and painful spasms an “A” (effective). They rated the treatment of the same symptoms with dronabinol, nabilone, or nabiximols a “B” (probably effective). In the treatment of MS-related bladder frequency, nabiximols treatment also received a rating of “B”. Oral cannabis extract was given a “B” rating for probably Ineffective in the treatment of bladder complaints and tremors in MS patients. Nabiximols use in the treatment of tremors was given a “C” rating for possibly ineffective, and smoked cannabis was rated a “U” for insufficient evidence (Schrot & Hubbard, 2016). In a separate review of existing literature, 14 studies that were assessed to establish the use of dronabinol, nabilone, nabiximols, or oral CBD/THC tablets to treat spasticity in 2,280 MS or spinal cord injury patients was rated as “moderate” quality. In those studies, cannabinoids were associated with greater improvements in spasticity versus placebo but failed to reach statistical significance (Whiting, et al., 2015). Despite some of these positive findings, there is currently no evidence that medical cannabis has an overall effect on the progression of MS (Mouhamed, et al., 2018). Cannabis and cannabinoid use in the treatment of epilepsy has been studied, especially in special populations of pediatric refractory epilepsy syndromes such as Dravet syndrome and Lennox-Gastaut syndrome which tend to respond poorly to existing antiepileptic drugs (AEDs). In 2015, Rosenberg et al, (2015), evaluated four primary clinical trials to examine the efficacy and safety of medical cannabis in seizures. Two of these studies showed partial antiseizure effect with CBD, and two showed no statistically significant effect. However, these studies were small, with insufficient blinding or randomization and incomplete data sets (Rosenberg, et al., 2015). The American Academy of Neurology and Cochrane reviews completed in 2014 both rated the evidence for cannabis use in the treatment of epilepsy limited, inconclusive, or insufficient. A parent survey of 117 children with intractable seizures reported an 85% perceived reduction in seizures with the use of plant-derived enriched CBD (Schrot & Hubbard, 2016). Mouhamed assessed treatment with THC to be too broad for therapeutic purposes but found positive findings when they reviewed five trials published between 2013 and 2018 studying the use of CBD in the treatment of drug resistant epilepsy in children or young adults. These studies showed a more significant reduction in frequency of atonic and partial seizures, followed by reductions in tonic/tonic-clonic seizures, with minimal reports of adverse effects. Of note, these studies did not utilize CBD as a replacement to the subjects’ AED, but as an adjunct (Mouhamed, et al., 2018). In contrast, Whiting et al found studies that reported seizures as a possible reported adverse effect of cannabinoid treatment (Whiting, et al., 2015). Although there exist multiple preclinical trials and several case reports regarding the use of CBD as an antiepileptic, only a small number of placebo-controlled clinical trials exist, and only one identified that is double-blind and published in a peer-reviewed journal. This study, published in 1980 in the Journal Pharmacology, evaluated 15 patients, eight of which received CBD orally for 8-18 weeks at a dose of 2-300 mg daily. Four of the eight CBD patients had significant resolution of their seizures, three had partial resolution, and all tolerated the medication well. Only one placebo patient noted improvement. Within this study, three of the CBD-treated patients had measurable electroencephalographic (EEG) improvements (Santos, Hallak, Leite, Zuardi, & Crippa, 2015). Cannabinoids have been tested for the treatment of various other neurological disorders and complaints, including anxiety, Parkinson’s disease, Tourette's Syndrome (TS), cervical dystonia, Huntington’s disease, schizophrenia, sleep disorders, depression, psychosis, and opioid or other substance use disorder. The American Society for Experimental Neurotherapeutics published a review of CBD use for the treatment of anxiety disorders. They identified preclinical evidence that strongly supports the use of CBD in the treatment of general anxiety disorder (GAD), panic disorder, social anxiety disorder (SAD), obsessive compulsive disorder (OCD), and post-traumatic stress disorder (PTSD). Human studies they reviewed supported use in healthy adults between 3-600 mg which acutely decreased induced anxiety without affecting baseline levels. CBD was also shown to decrease anxiety in patients with SAD, and acutely enhances fear extinction, which may prove useful in the treatment of PTSD. But these studies all utilized acute dosing and small sample sizes, so further studies would need to be done to extend the patient population tested, establish independent replication, and determine if chronic use is as effective and safe in other anxiety disorders. (Blessing, Steenkamp, Manzanares, & Marmar, 2015). The American Academy of Neurology review in 2014 assessed oral cannabis extract, dronabinol, and nabilone as “probably ineffective” for the treatment of Parkinson’s disease and tremors, and nabiximols as “possibly ineffective” for tremors. They found insufficient evidence supporting the use of cannabinoids in TS, cervical dystonia, and Huntington’s disease. The 2013-14 Cochrane review found limited/inconclusive evidence for the use of cannabinoids in the treatment of schizophrenia or cannabis use disorder. Schrot and Hubbard identified a systematic review from 2015 using plant-derived CBD in the treatment of psychosis that showed “potential” as an antipsychotic but suggested a large randomized clinical trial in order to support regular clinical use. Similarly, a 2015 systematic review of cannabinoids in the treatment of substance abuse/addiction showed “potential” (Schrot & Hubbard, 2016). Due to its therapeutic effects on mood, anxiety, sleep and pain, CBD has been established as “potentially beneficial” in the treatment of opioid use disorder and addiction (Hurd, et al., 2015). Whiting et al identified only low-quality evidence showing no benefit for the use of CBD in psychosis treatment, and positive but low-quality evidence for the use of nabilone or nabiximols in sleep disorders or THC capsules in TS. What they deemed as very low-quality evidence suggested no benefit from the use of nabiximols in the treatment of depression (Whiting, et al., 2015). When the current published evidence was assessed by Mouhamed, et al, their conclusions were that CBD increased quality of life (QOL) scores in Parkinson’s patients, and may help in the treatment of schizophrenia, but that THC increased symptoms of psychosis. They found studies on patients with PTSD showed consistently decreased frequency of nightmares when treated with nabilone or 5mg THC in oil, and several case reports of decreased tic severity and frequency in TS when given CBD/THC daily. Unfortunately, they found “mixed results” regarding cannabinoids in the treatment of opioid use disorder (Mouhamed, et al., 2018). When considering cannabinoids in the treatment plan for neurological disorders, it is an important fact to keep in mind that nearly all of the studies reviewed list anxiety, dysphoria, psychosis, hallucinations, paranoia and possible perceptual changes as potential adverse effects of cannabinoid products which contain THC. The use of cannabinoids in oncology patients have been moderately successful when used to treat cancer related pain, but studies used smoked THC and nabiximols only, neither of which are currently FDA approved (see further details above). Otherwise, there exists low-quality evidence that nabiximols and dronabinol are effective for nausea and vomiting related to chemotherapy agents (see further details below). Both dronabinol and nabilone are currently approved for this use. (Whiting, et al., 2015). The National Cancer Institute (NCI) reports a beneficial effect of the cannabinoids dronabinol and nabilone when used for nausea and vomiting related to chemotherapy but reported inconclusive evidence on the use of smoked/inhaled cannabis for chemotherapy-related nausea and vomiting (NCI, 2018). According to the American Cancer Society (ACS), there is potential evidence based on in vitro studies that THC and CBD can slow the growth and potentially even cause cell death in certain types of cancer cells. In preclinical trials cannabinoids reduced the spread of some form of cancers. While early clinical trials of cannabinoid use in cancer patients have proven safe, they have not yet proven to be effective in curing or helping to control the disease (American Cancer Society, 2017). A study completed in Israel assessed the potential effect of THC and CBD in neuroblastoma, the most common extracranial solid tumor in pediatric patients. The in vitro portion of the study indicated that both THC and CBD had antitumor activity, reducing the viability and invasiveness of the tumor cells and in some cases inducing apoptosis. CBD was the more effective of the two compounds. In the in vivo portion of their study, neuroblastoma tumors were induced in non-obese diabetic immunodeficient mice and the mice were then treated for 14 days with either THC, CBD, pure ethanol (control), or were untreated. CBD slowed the growth of the tumors, as did THC, but to a lesser degree. While the exact mechanisms for how these drugs produced the observed effects is yet to be fully understood, the authors understandably suggested larger, more in-depth studies in the future to further explore this potential (Fisher, et al., 2016). According to the NCI, a small pilot study investigating intratumoral injections of THC in nine patients with recurrent glioblastoma multiforme (GBM) showed no clinical benefit but a good safety profile. A trial in Israel testing oral CBD in patients with recurrent solid tumors has no published results yet. A phase II study done in the United Kingdom using nabiximols with temozolomide in patients with GBM has 21 enrolled subjects with final results still pending (NCI, 2018). Due to the presence of CB1 receptors in the gastrointestinal tract, certain GI effects have been credited to and therapeutically tested in cannabinoids. As previously mentioned, both nabilone and dronabinol are currently approved for the treatment of nausea and vomiting related to chemotherapy treatments. Dronabinol is also approved for the treatment of anorexia and weight loss secondary to HIV/AIDs. The evidence was rated as low quality but did show evidence of benefit from both of these medications for their respective approved uses. The four studies reviewed for appetite stimulation and weight gain included 255 participants and compared dronabinol with placebo (3 of 4) or megestrol acetate (Megace) (1 of 4). One study also compared with cannabis. Trials all showed improved weight gain with dronabinol or cannabis versus placebo, but the study comparing megestrol acetate found less weight gain with dronabinol. Combining dronabinol with megestrol did not seem to have additive benefit (Whiting, et al., 2015). According to Health Canada, the cannabinoid products performed at least as well and sometimes better than ondansetron, but with higher rates of adverse effects. Two trials evaluated THC in postoperative nausea and vomiting and found no significant difference compared to placebo and unacceptable adverse effects reported. In patients diagnosed with inflammatory bowel disease (IBD), self-medicating users reported decreased abdominal pain, nausea, diarrhea, and joint pain and increased appetite with cannabis use, but there is a lack of reliable clinical evidence as these are the results of self-report observations and not a clinical trial. The use of cannabis in IBD patients also correlated to higher rates of surgical procedures, leading the authors to question if the cannabis could be masking disease activity/progression (Mouhamed, et al., 2018). Potential adverse effects of cannabinoids vary greatly depending on the composition of the product being evaluated. In epilepsy studies, adverse effects of CBD were reported as fatigue/somnolence, diarrhea, and decreased appetite, while cannabis and THC caused nausea, dizziness, weakness, behavioral/mood changes, hallucinations, suicidal ideations, fatigue, and feelings of intoxication (Rosenberg, Tsien, Whalley, & Devinsky, 2015). In addition to the effects listed above, Schrot and Hubbard also listed anxiety, dysphoria, psychosis, impairment of memory, coordination, judgment, attention and/or perception, tachycardia, hypertension, increased cardiac output, redness of conjunctiva, increased appetite, dryness of mouth, and increased risk of being involved in a motor vehicle accident as potential acute adverse effects. Chronic use also carried with it risk for memory and cognitive deficits, psychosis, respiratory and immune system effects that increased the risk for infections, airway inflammation and bronchitis, social dysfunction, difficulty in school for adolescents, decreased job performance, increased unemployment, decreased income levels and decreased satisfaction with life. While the addiction potential is lower for cannabis than other illicit substances, there does exist a roughly 9% risk for physical/psychological addiction in adults. A Lancet study in 2007 ranking controlled substances for a “mean harm score” ranked cannabis #11 out of 20 (Schrot & Hubbard, 2016). The 2015 meta-analysis in JAMA reviewed acute adverse effects published in 62 studies and corroborated the aforementioned effects, as well as complaints of euphoria, paranoia, and seizures (Whiting, et al., 2015). According to the multiple large studies, there does not appear to exist a clear epidemiological link between marijuana and lung cancer, such as that seen with tobacco users. It remains inconclusive and a topic for further exploration, as cannabis may carry some increased risk of testicular, prostate, or squamous cell carcinomas (NCI, 2018). These guidelines are intended to reduce the overall risk of adverse effects from cannabis use and are not a guarantee against adverse effects in any particular patient. Hopefully, these recommendations can help inform patients who may be willing to modify their use so as to reduce some of the health risks (Fischer, et al., 2017). In 2014, a federal farm bill legalized the study of hemp, and many have elected to interpret this as a legalization of products containing CBD, which is a hemp derivative. Despite warnings that the FDA has issued stating that CBD should not be contained in food or supplement products sold between states, the purchase and shipping of these products between states does occur. Regarding CBD specifically, the DEA has stated that while it is still illegal, it is not currently an enforcement priority. National retailers Target and Wal-Mart previously sold products that contained CBD and have pulled those products from their stores and websites (Chaker, 2018). In 2015, the US Department of Health and Human Services announced that it would no longer require non-federally funded cannabis studies to be vetted and approved by the Public Health Service (PHS), removing a hurdle and helping to facilitate further research (US Department of Health and Human Services, 2015). In 2016, polls conducted by Gallup and Quinnipiac University indicated 54-60% of Americans polled supported legalization of cannabis without further restrictions, and 81% supported legalization for medical use. Despite this public approval, individual prescribers remain concerned about potential threat to their federal DEA registration status and hospitals are reluctant to embrace cannabinoid treatments for fear of losing their federal Medicare/Medicaid funding (Bridgeman & Abazia, 2017). California was the first to legalize medical marijuana use with Proposition 215 in 1996. Currently, there exist comprehensive medical marijuana access laws in 31 states as well as Washington DC, Guam, and Puerto Rico. Adult recreational use is allowed (without medical certification required) in Alaska, California, Colorado, Maine, Massachusetts, Nevada, Oregon, Washington, Washington DC, and Vermont. There are no marijuana access laws currently in Idaho, South Dakota, Nebraska, Kansas, Virgin Islands, American Samoa, or the Northern Mariana Islands. 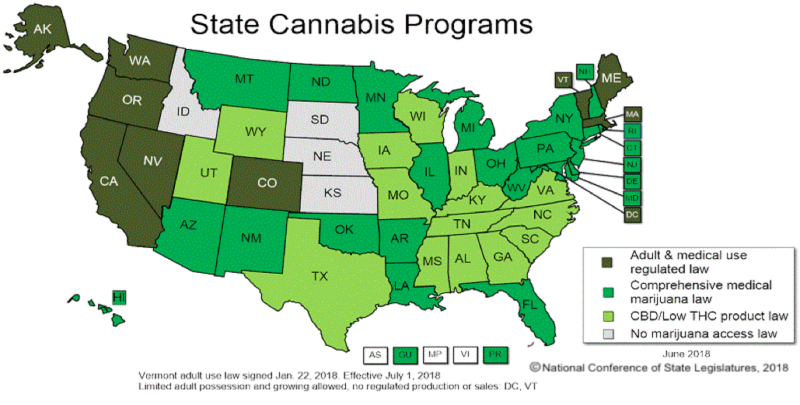 In addition, 15 states currently allow middle-ground low THC/high CBD products for medical purposes (National Conference of State Legislatures, 2018). Please see the graphic below for greater details or keep up with the latest regulation in your state by checking the National Conference of State Legislature’s website (NCSL.org). Cannabis is currently legal for adult use in Canada as well as parts of Europe. Regarding the future of cannabis and cannabinoid use in medicine, many researchers feel that the future of cannabis in medicine is not likely with cannabis as a whole, but instead in distilling and purifying the most therapeutic components to ensure a reliable, pure, and consistent product that has the ability to stand up to strict standards put forth by the FDA. This may include products containing CBD that may function as antipsychotics, antiepileptics, or treatments for addiction. Other suggestions for future research include a CB1 antagonist for obesity or addiction treatment, a synthetic CB2 agonist as an anti-inflammatory in the treatment of scleroderma, or a mixture of cannabinoids for the treatment of diabetes or metabolic syndrome. Alternatives for pain medications could also explore drugs that inhibit the enzymatic degradation of the endogenous receptor agonists anandamide or 2-AG (Schrot & Hubbard, 2016). Larger randomized clinical trials are suggested on the use of cannabinoids for weight gain in HIV/AIDs patients, depression, sleep disorders, anxiety disorders, psychosis, glaucoma, and TS. Between 50-99% of the study participants were Caucasian/white, and thus future research should also aim to broaden our understanding of any potential variability in effect amongst different races (Whiting, et al., 2015). The general consensus amongst the medical community is that the use of cannabinoids and the manipulation of the endocannabinoid system holds immense medical potential, but at the current time additional research is needed to confirm in whom and how exactly this should be carried out for optimal benefit and minimal risk.